Vol. 5 No. 10 of al-Majalla al-Tijarriya dated October 1923. Vol. 5 No. 7 of al-Majalla al-Tijarriya dated July 1923. 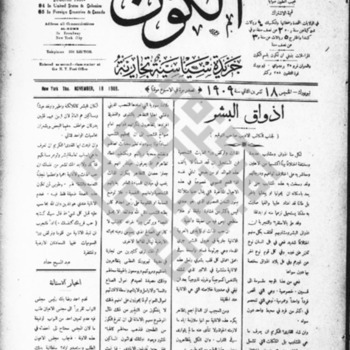 An issue of al-Kown dated August 12, 1909. An issue of al-Kown dated July 22, 1909. An issue of al-Kown dated November 19, 1908. An issue of al-Kown dated August 13, 1908. An issue of al-Kown dated October 10, 1907.